The Cumberland & Dumfriesshire Farmers Mart had forward 1,577 ewes with lambs at foot at their sale at Longtown on Tuesday 7th June, 2011. A similar show, all classes dearer on the week. Ewes with singles to a top of £131 for a Beltex from Whitehill Cottage; Suffolk £84 South Mains; Texel £82 Low Brooms; Greyface £74.50 South Mains; Hill Cheviot £64 South Mains; Swaledale £58 Colte Coates; Blackface £56.50 Bayles; Lleyn £55.50 Colte Coates; Gritstone £53 Colte Coates; Herdwick £53 Colte Coates. Ewes with twins to £93 for Beltex from Whitehill Cottage; Texel £82 Low Brooms; Suffolk £80.50 South Mains; Greyface £72, £71 Aimshaugh, £70 Whitehill Cottage; Half Bred £72 Colte Coates; Hill Cheviot £64 South Mains; Lleyn £55.50 Colte Coates; Gritstone £53 Colte Coates; Blackface £48.50 Low Northsceugh. Shearlings with singles to £82 for Texels from Low Brooms. Shearlings with twins to £82 for Texels from Low Brooms; Greyface £72 Snowden Close. Hoggs with singles sold to £88 and £85 for Texels from South Mains, £83 Prospect, £82 Patties Hill, £80 Kinning Hall and Rabygrange; Greyface £82 Knells, £80 Prospect, £79 Snowden Close, £78 Raby Grange; Cheviot Mule £80 Prospect. Hoggs with twins to £66 and £61 for Greyface from Patties Hill; Texel £62 Kinning Hall. 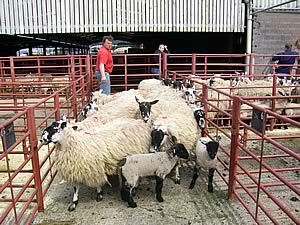 Geld hoggs to £130 for Greyface from Knells; Texel £110 Stackbraes. Cast ewes to £107 Low Brooms. Cast rams to £160 Low Brooms. Store hoggs to £47 South Mains.